The title of this post is the same as that of this article on Liverpool Business News. Merseyrail has announced details of the next phases of station closures as it upgrades is platforms to make them ready its new £460m fleet of trains due to come into service in 2021. In total, there are eleven phases of work to give all platforms level access to the new trains. 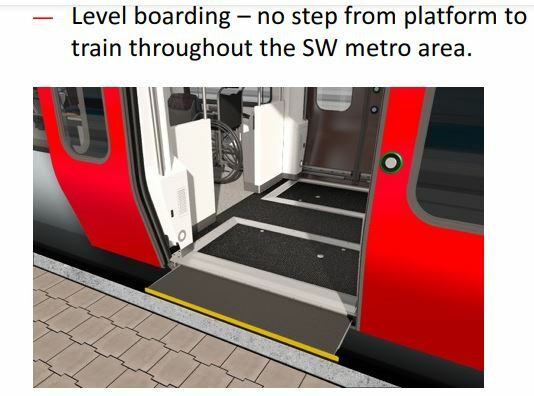 I am fairly sure that no other local rail network in the UK, will have this quality of level access. 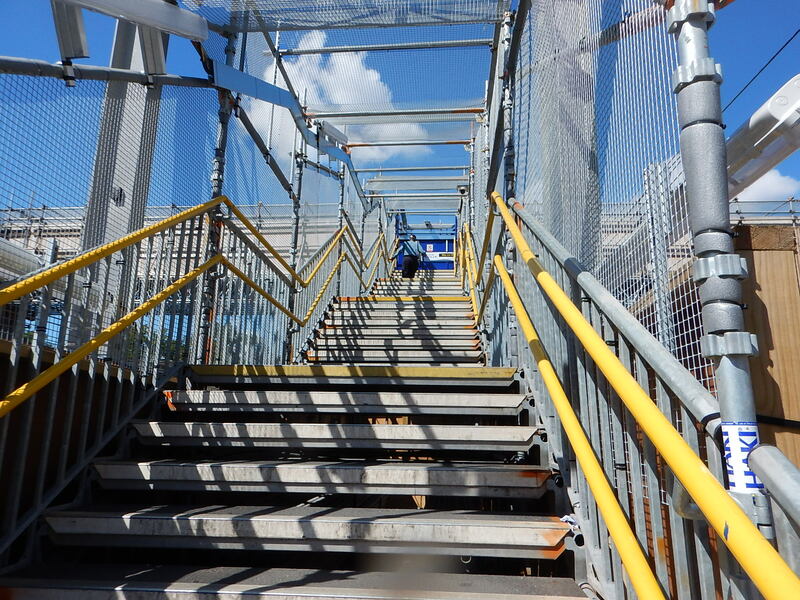 Some stations on the London Overground have similar access, but not that many. When you consider, that many station platforms have been rebuilt and they are only used by Class 378 trains, I believe an opportunity was missed. The article says this about Merseyrail‘s new Class 777 trains. Swiss manufacturer Stadler has started the manufacturing process at its Szolnok plant in Hungary on the new fleet of 52 trains. There, the car-body production is under way with the units being machined, welded, sandblasted and coated in special protection and premium quality paint to combat corrosion, caused by the contact with sea-water. Most of the current Class 507/508 trains are forty years old, but they appear to me to be one of the most bottom-friendly suburban trains in the UK, with desirable 2+2 seating. I regularly travel on Class 313 trains, which are similar trains of the same vintage, into and out of Moorgate, and these are scrapyard specials compared to Merseyrail’s spotless, spacious and comfortable trains. These pictures from March 2017, show the current trains. They certainly look to be in good enough condition to see all the new trains into service and through their inevitable teething troubles in the next couple of years. ,The care being taken by Merseyrail and Stadler in the preparation for and design of their new trains, seems to indicate that they are intending to get forty years out of the new fleet. I went to the new Maghull North station today. There are still a few things to do, like add the grass and complete the lifts, but the station is now operational. I have a feeling that this could be a station, where the car parks could be a victim of the station’s success. There weren’t many spaces today. Car parking does appear to be free and a p[passenger who lives nearby, said that you can never park at Maghull station, which is the next station towards Liverpool. There didn’t appear to be a kiosk of any sort. I didn’t see a ticket machine and the ticket office was closed! It looked to be a well-built and functional step-free station. The UK has several modern tram systems. If you look at the cross section of trams you get the following figures. I wonder why Nottingham is twenty-five centimetres narrower! If you look at the Class 399 tram-train, it has a width of 2.65 metres and a height of 3.67 metres. So no wonder, there has been no problems with Class 399 tram-trains running on the Sheffield Supertram as trams! Various trains that run local rail networks include. These are some figures from German trains. I’ll look at various issues. I think this is not a big issue. If a tram or electric train can run on a particular track, then there should be no height problems running a tram-train over the route, providing overhead wires can be erected. It would appear that the maximum width of UK trains is 2.82 metres. In some stations, where there is only one class of train, level access is possible. The picture shows a Class 378 train on the London Overground. This is not one of the best I’ve seen, but there is no reason, why someone in a wheelchair shouldn’t be able to wheel themselves into every train at every station. This is in the train operating company’s interest, as one of the things that delays trains, is getting someone in a wheelchair on and off the train with a portable ramp. If we take the UK train width of 2.82 metres and compare that to the width of a Class 399 tram-train, which is 2.65 metres, that means that there is seventeen centimetres difference or eight and a half centimetres on each side of the train. 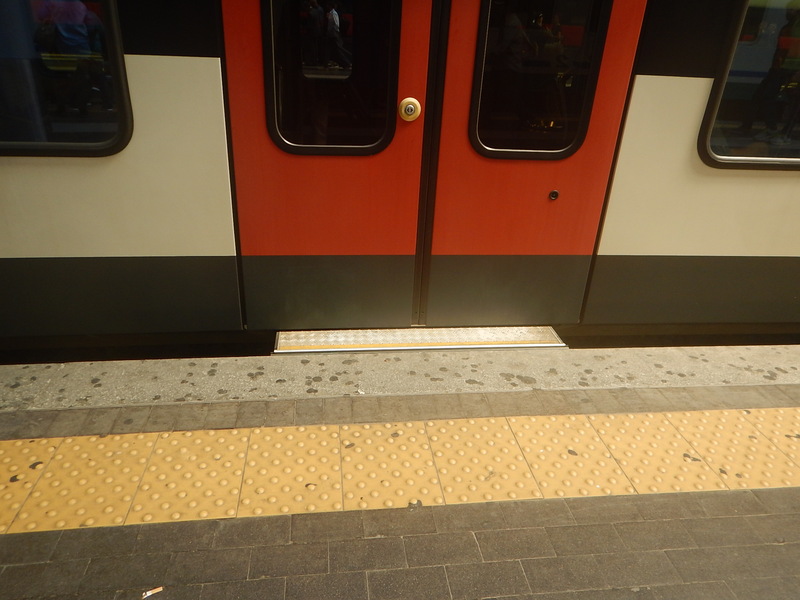 If the platform can be arranged to be level, that is not a large gap. It’s probably about the same size as this gap in this picture. Shown is a Class 399 tram-train at a tram stop on the Sheffield Supertram. But on the Continent, where the trains are wider and the loading gauge is bigger, the gap will be larger. Trains on the Continent also often have a significant step up as this picture shows. Shown is an Italian High Speed train. 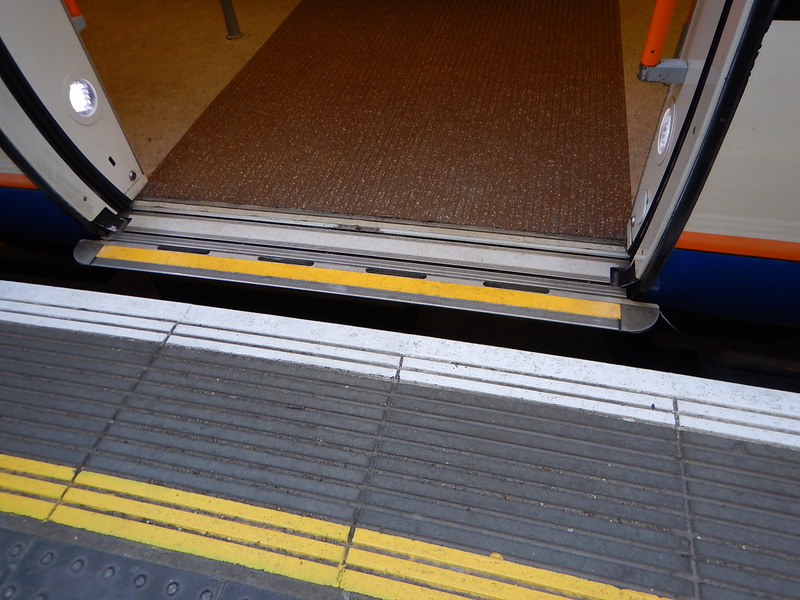 If the EU wanted to improve train travel for the disabled, those in wheelchairs, those with buggies and the elderly, they should make it compulsory for all trains to have level access from the platform. It’s very rare to find level access on the Continent and not that easy in parts of the UK. But things are getting better, as this picture shows. Shown is a Stadler Flirt with a rather nifty automatic gap filler. Gap fillers will be fitted to Merseyrail‘s new Class 777 trains, which are being built by Stadler. The Class 777 trains and the current Class 507 trains have the same width of 2.82 metres, but the new Stadler trains have an eighteen centimetre lower floor. The picture shows a Class 507 train at one of Liverpool’s underground stations. Eighteen centimetres wouldn’t be far away from the height of the step in the picture. The design must also allow both classes of trains to be in service at the same time, to ease introduction of the new Class 777 trains. For services around Cardiff and on the Cardiff Valley Lines, KeolisAmey Wales intend to acquire the following fleet. The Stadler Flirts look very similar to Greater Anglia‘s Class 755 trains, that by the time of delivery of these trains for Wales, will have proven themselves on the mountains of East Anglia. The tri-mode multiple units will be able to run on electric, diesel or battery power. 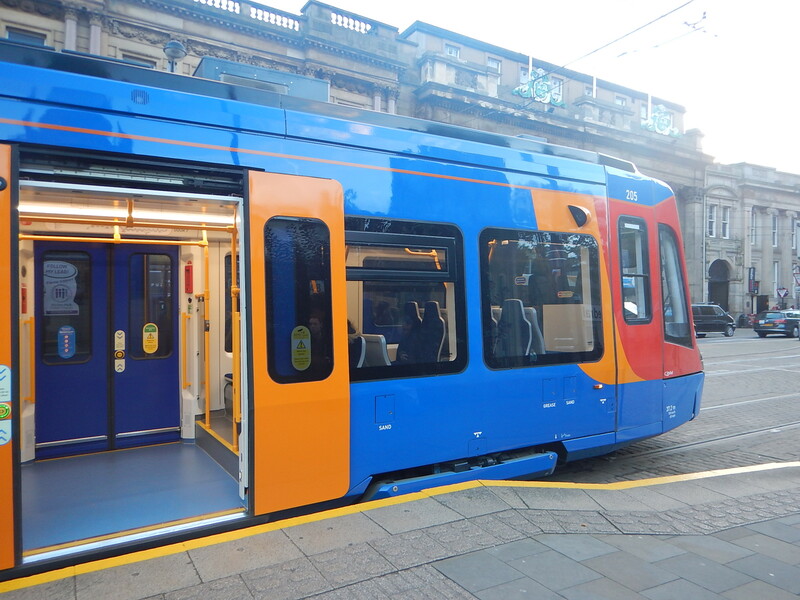 The Stadler Citylink Metro Vehicles look very similar to Sheffield Supertram‘s Class 399 tram-trains, that are providing a tram service in Sheffield and will soon be running on the rail network to Rotherham. It is an all-Stadler fleet. This is a clip from the KeolisAmey document. This looks like a visualisation of one of the Flirts, as the Citylink tram-trains have flat sides. I will be very surprised if Stadler don’t provide the Cardiff area, with one of the best step-free networks in the world. The UK’s standard tram width of 2.65 metres and our small loading gauge must make it easier to design tram-train systems for the UK. The service on the Ormskirk Branch Line between Preston and Ormskirk stations is an infuriating one. The Class 153 trains that run the service seem to be unreliable when I use it. The frequency is roughly hourly and not clockface by any means. Sometimes the trains are very full. The signalling appears to be old-fashioned. But it seems that from May 21st, things will be getting better. The timetable shows the following. Trains leave Ormskirk hourly from 07:01 until 23:11 and take 31 minutes to get to Preston. Trains leave Preston hourly from 06:26 until 21:26 and take 30 minutes to get to Ormskirk. Journey times are actually similar to now, so I would assume they are for a Class 153 train. What a pity, that the round trip will take over an hour. Northern will need two trains to run this service, but if they could do a round trip in an hour, only one train would be needed. The Class 153 train is only a 75 mph train. Part of the journey is along the electrified West Coast Main Line. Class 769 train – 100 mph on electric, 90 mph on diesel. I suspect that any one of these trains could achieve the hourly round trip. All would offer increased capacity and better quality interiors. The Class 769 train would handle the route with ease. The train could use the electrification on the West Coast Main Line. It is a four-car train. I doubt it will happen, but the trains could continue on the Merseyrail network, if their third-rail electrification shoes, were to be refitted. But who knows what will happen if Merseyrail and Northern decide to bring the railways between Blackpool, Kirkby, Ormskirk, Preston, Southport and Wigan into the twenty-first century? There’s certainly a lot happening in the area at the timetable change on May 20th. Blackpool to Liverpool gets an electric hourly service. Blackpool to Manchester Airport gets an hourly service, which will go electric in time. Ormskirk to Preston gets a proper hourly service. Wigan North Western to Alderley Edge gets a new service using Class 769 trains. Wigan North Western to Stalybridge gets a revamped service using Class 769 trains. Porterbrook’s affordable bi-mode Class 769 train seems to be fully involved. This article on Rail Technology Magazine is entitled Alstom: Industry must start work bringing hydrogen trains to UK immediately. In an exclusive interview with RTM, Mike Muldoon, who leads on hydrogen for Alstom in the UK, also warned that if the British rail industry did not start trying to bring in hydrogen trains as quickly as possible, the country’s market could become less attractive. Could it be that Alstom see the opportunity for hydrogen-powered trains closing and want to make sure that the UK Government comes on-side? Would The Coradia iLint Be Able To Run In The UK? This document on the Alstom web site is a data sheet for the Coradia iLint. Unfortunately, the data sheet doesn’t give the height and width of the iLint, but I suspect that these and other dimensions are not much different to typical UK values. Even if the current iLint is wider and taller, I suspect that on a lot of routes a Coradia iLint would be able to run. The Alstom Coradia iLint was developed from an existing train in a few months, in much the same way that Bombardier’s Class 379 BEMU prototype was created. There would be the following differences between a UK and a German version. Adjusted height, with and platform height. Would a different pantograph reach be required? 25 KVAC instead of 15 KVAC. Would a third-rail 750 VDC version be needed? Point 1 is probably covered by the way modern trains are built. Point 2 is down to the pantograph manufacturer. Point 3 is covered by developing an electrical system that handles both voltages. After all 25 KVAC will be needed for France. Point 4 just needs the appropriate third-rail shoe and electrical system. I think that all this could mean that a UK version of the iLint could be developed within a reasonable time and budget. Have Alstom Said Anything Else About For The UK? This article on the Engineer web site is entitled Alstom Eyes Liverpool Hydrogen Train Trials. It would appear to be a good choice for the following reasons. Alstom’s UK base is at Widnes, which is in the South-East of the Liverpool City Region. Merseyrail have shown in recent years, that they can think out of the box, about using trains and would be a very able partner. The article suggests that Liverpool to Chester via the Halton Curve could be the test route. The route is partly electrified from Runcorn to Liverpool. The route passes close to Alstom’s base. The section without electrification from Runcorn to Chester is probably about twenty miles long, which is a good test, but not a very difficult one. I don’t think that there are too many low over-bridges that would need to be raised. There would also be good opportunities for publicity and photographs. Hydrogen is available locally from the various petro-chemical industries along the Mersey. Incidentally, I used to work in a chlorine plant at Runcorn, where brine was split into hydrogen and chlorine by electrolysis. There were hydrogen tankers going everywhere! Does the industry still exist? If you look at a map of the railways in the area, there are several other possibilities of other services. The trains might be a possibility for the Borderlands Line. Hydrogen trains would seem to be a possibility for running services in the Liverpool area and especially over the Halton Curve. Liverpool to Crewe via Runcorn is electrified. Hydrogen-powered trains could easily handle the routes without electrification. There is a plentiful local supply of hydrogen. There will be no great difficulty in updating the track and signalling. Services could be run by existing diesel trains, until the new trains are available. I also feel that Stadler’s new Class 777 trains for Merseyrail, when fitted with the ability to run on 25 KVAC overhead electrification and batteries could be able to handle Halton Curve routes. Although, it is obviously very feasble to run hydrogen-powered trains, I have a feeling that the finances might not be as simple. Especially if Stadler make sure that their new Merseyrail trains can extend the Merseyrail network to town along routess without electrification. Are Alstom stepping up the pressure, as they can see other trains arriving? Skelmersdale is the second largest town in the North West of |England without a railway station. But it does appear that things are progressing towards the town having what is probably a much-needed station. This article in the Southport Visiter is entitled Funding boost for new rail link to Skelmersdale. Reading the article, you get the impression that all the stakeholders have got together and come up with a sensible plan. The article says this about the route. 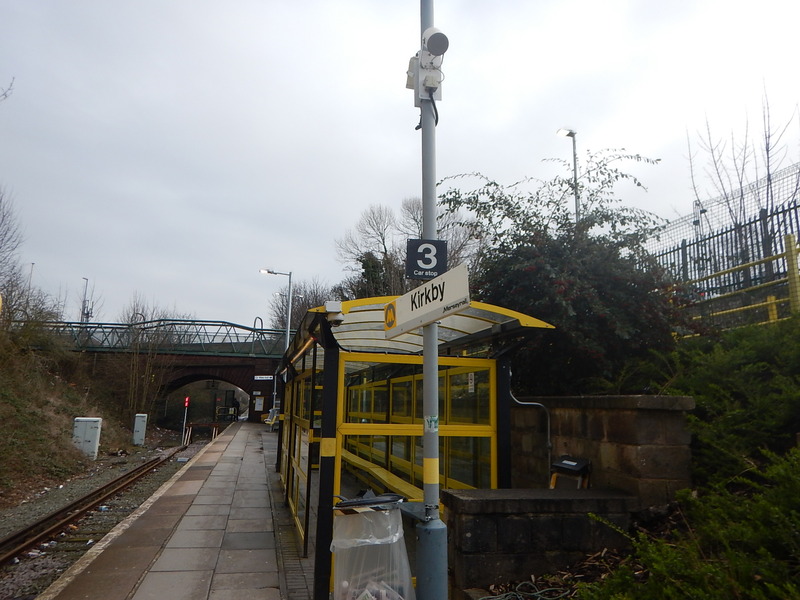 The plan would see Merseyrail services extended on from the current terminus at Kirkby station to serve Headbolt Lane, Rainford and Skelmersdale. Skelmersdale would become the new interchange for Merseyrail, and Northern Services on to Wigan and Manchester. This would seem to be a well-thought out plan to use Skelmersdale as an interchange. 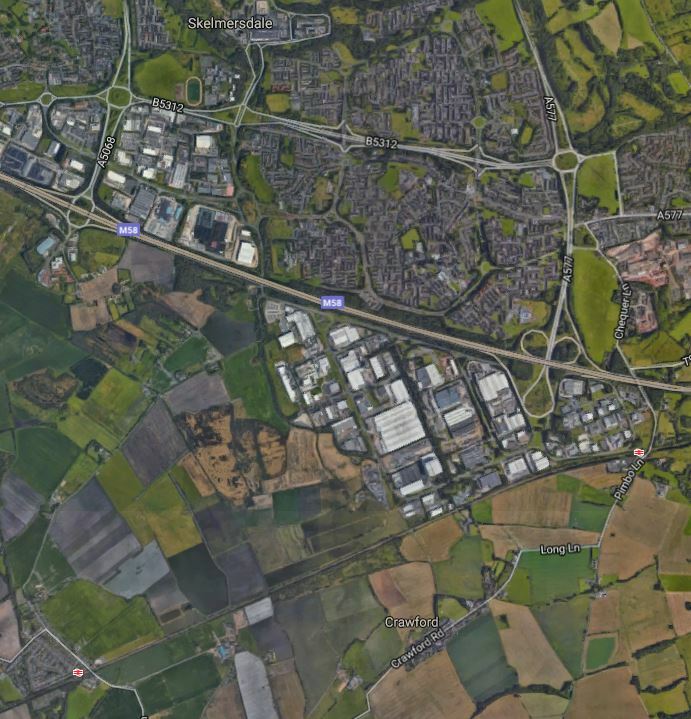 This Google Map shows the Southern part of Skelmersdale and the railway that runs through Rainford and Upholland stations. The town centre of Skelmersdale is the Concourse, which is marked by the town’s name in the top-centre of the map. The Kirkby Branch Line runs across the map. Rainford station is in the South-West corner of the map. Upholland station is on the left-centre of the map. Kirkby station and the new Headbolt Lane station would be West of Rainford station on the existing line which is single track. The track from Rainford through Upholland and to the East is double-track. It looks like a triangular junction would be created East of Rainford, that would allow trains from both the East (Upholland, Wigan and Manchester) and trains from the West (Kirkby and Liverpool) to turn to the North to a station in Skelmersdale. Looking at the area in more detail from my virtual helicopter, I’m certain that a station could be placed close to the town centre with the capability of handling four trains per hour from both Liverpool and Manchester. The station would probably need two platforms; one for Liverpool and one for Manchester. There would be various possibilities for the track layout between the station and the existing Kirkby Branch Line. In the simplest form, each platform would have an independent single track, which would allow trains from both Liverpool and Manchester to arrive and depart from Skelmersdale simultaneously. I would also arrange the two platforms as opposite faces of a shared island platform. Trains from Liverpool and Manchester would arrive at the same time. Trains to Liverpool and Manchester would depart a few minutes later at the same time. 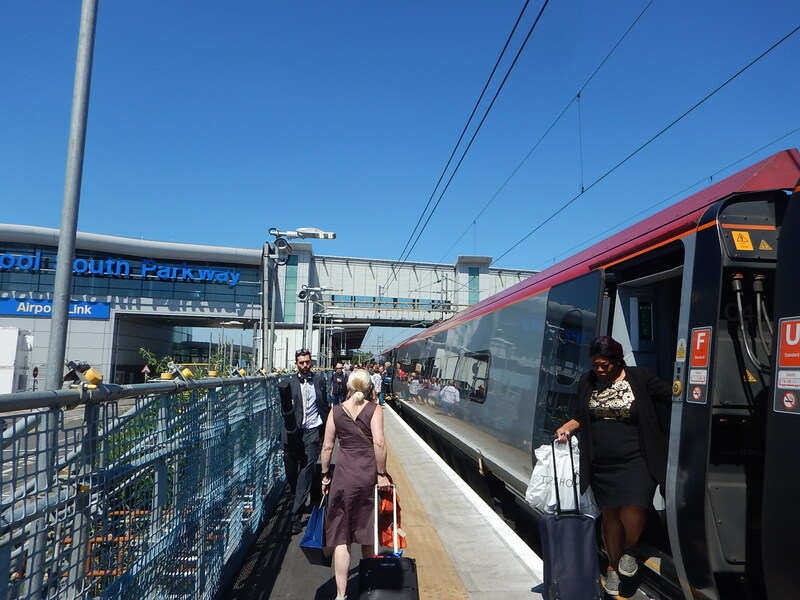 Passengers needing to change at the station would only have to walk across the platform and wait for the other train to leave. A coffee kiosk and a shop could be positioned on the shared platform. The Northern end of the platform could be open and passengers could walk straight into the Shopping Centre or to the parking. It would not only be passenger-friendly, but totally step-free and very affordable. The only restriction would be that trains must be able to do the following in under fifteen minutes. Travel from the Kirkby Branch Line to Skelmersdale station. Turnback the train at Skelmersdale. Travel from Skelmersdale station to the Kirkby Branch Line. I have said fifteen minutes, as that would be needed for four trains per hour. This might not be possible with the current Class 508 and Class 142 trains, unless they were extremely well driven, but Merseyrail’s new Stadler trains and Northern’s 100 mph Class 319 trains, would probably be able to handle the service. It would be a unique way to serve a town like Skelmersdale, which is a few miles from a double-track line. The only complicated track-work needed would be where the branch joined the Kirkby Branch Line. Merseyrail’s network is electrified using 750 VDC third-rail, whereas if the line to Manchester were to be electrified it would probably use 25 KVAC overhead wires, as has been used all over North-West England. Keeping the two lines independent would enable each to have its own system. This layout has been used between Dalston Junction and Highbury and Islington stations on the London Overground and it has worked successfully for over seven years. The article in the Southport Visiter also says this. Merseyrail’s new trains will be running on the existing network from 2020, and trials to run them beyond the existing electrified ‘third rail’ track could help inform the scope of the Skelmersdale scheme, potentially meaning that major changes to install electrified track wouldn’t be needed. Developments in Northern trains over the next few years could also remove the requirement for lineside infrastructure and power connections as part of the project. In Battery EMUs For Merseyrail, I talked about how Stadler were going to fit batteries to two of the new Merseyyrail trains. I’m sure that if the third-rail electrification was extended from Kirkby to Rainford, that one of the new Stadler trains will be able to reach Skelmersdale and return. The Stadler trains might even be able to travel from the existing electrification at Kirkby to Skelmersdale and back. Northern could run the service between Skelmersdale and Manchester, using their new Class 769 trains, which can operate on lines with or without electrification. This could mean that the link to Skelmersdale station could be built without electrification. Kirkby station would only need minor rebuilding as it is effectively a single long platform, where Liverpool and Manchester trains meet head-on. The barrier in the middle of the single-track under the bridge would need removing and there would be some moving of signals, but nothing very expensive would be needed. Headbolt Lane station would be another single platform station, which would serve trains going between Liverpool and Skelmersdale. Rainford station wouldn’t need any modification, but it might be reduced to a single step-free platform. The article in the Southport Visiter says this. 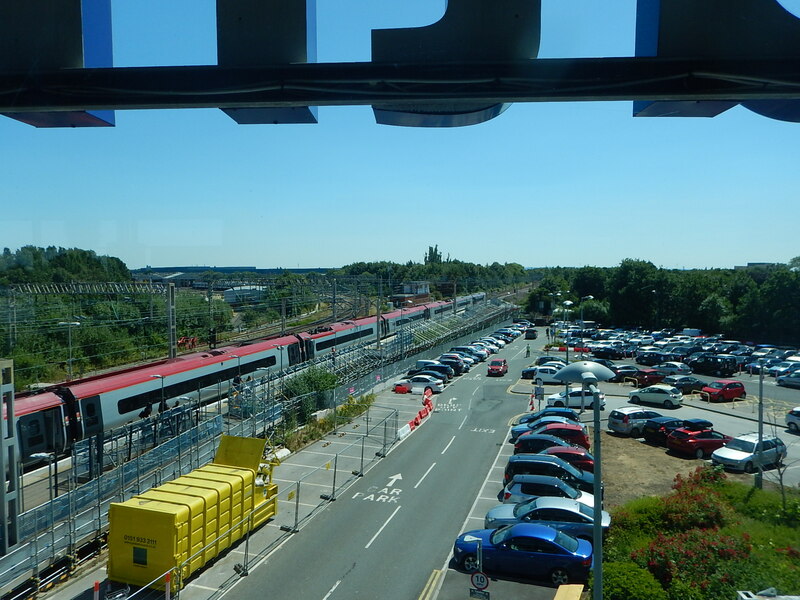 The Skelmersdale Project is led by Lancashire County Council, involving Merseytravel, West Lancashire Borough Council, Merseyrail, Northern Rail and Network Rail. This must be the key to the success of the project. The article in the Southport Visiter says that the current estimate of the project cost is £300 million. These actions will need to be done. Create the track to connect Skelmersdale station to the Kirkby Branch Line. Build a shared double-platform station at Skelmersdale. Build a single-platform station at Headbolt Lane. Deliver the new Stadler trains and ascertain their range on batteries. Northern must acquire some trains for Skelmersdale to Manchester. It looks to me, that a budget of £300 million would be adequate. The major work would be creating the junction East of Rainford station and the route to Skelmerrsdale and its new station. If it could be built without any major electrification, it shouldn’t be the most difficult of construction projects. Headbolt Lane station could be built as a single platform alongside the existing line. It looks to me, that this is a classic project that fits into Network Rail’s new philosophy as outlined in this article in Rail echnology Magazine, which is entitled Carne: I’m determined for private sector to directly invest in railway. It is an excellent plan! This article on the Times and Star website is entitled Mind the snores! Snail’s-pace trains four times slower outside South East. Trains connecting Britain’s major towns and cities are up to four times slower outside the South East, according to new research. The example that they give between Liverpool Central and Chester stations, is one that I can use to illustrate the problem. Currently, services on this route are run by nearly forty-year-old Class 508 trains, that are only capable of 75 mph. The speed limit on the Wirral Line is just 70 mph, so the well-maintained elderly trains can’t even stretch their legs properly. The route has thirteen stops. The timing is dreadful, if you consider that Merseyrail has exclusive use of the line. The new Stadler Flirt trains are promised to save nine minutes between Southport and Hunts Cross stations, because they are better designed for passenger entrance and exit with faster speed and better braking and acceleration. Applying this saving to the Liverpool Central to Chester route would reduce the time from 41 minutes to 35 minutes. If these Swiss trains can get a roll on, I do wonder if they could do the round trip in under an hour, which would mean Merseyrail could run a four trains per hour (tph) service with just four trains. The slower Class 508 trains need six trains. This logic can apply to a lot of rail lines in the UK. The reasons for slow trains can be summed up as follows. Trains are timetabled for the slowest trains that work the route. A lot of routes, including quite a few in the South-East are timetabled for elderly scrapyard specials. Line speeds can often be improved by five or ten mph. Modern trains like Merseyrail’s new Flirts are designed to minimise the time it takes to stop at a station. This is referred to as the dwell time. Platforms and trains don’t always match up well. Level crossings can be a nuisance on some lines like the York to Scarborough Line, which has 89 of the little darlings in forty-two miles. Trains can be speeded up by doing the following. Improving platforms, track and signalling to the highest possible standard and safe line speed. Choose trains that can make use of the good infrastructure. Consign scrapyard specials like Pacers and Class 508 trains to a well-deserved but long-overdue retirement. 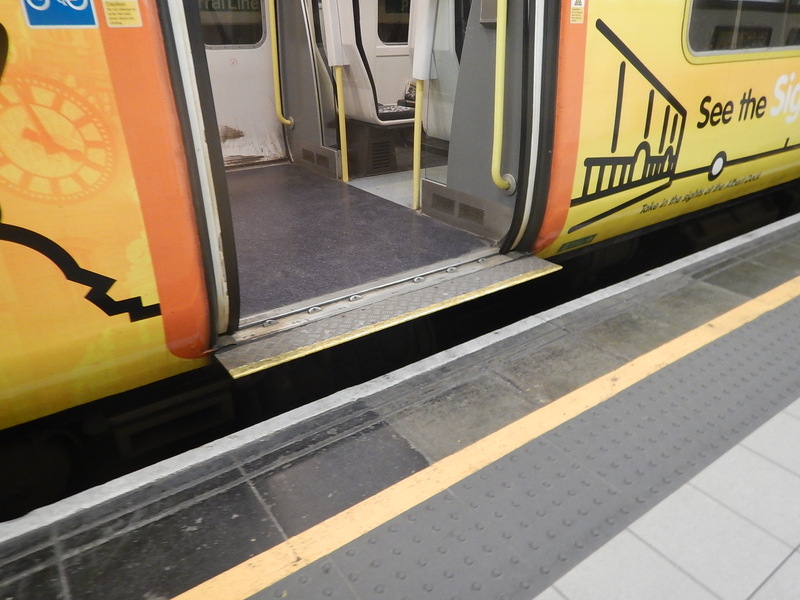 Make sure that train entry and exit for wheelchair users, persons of reduced mobility, buggy pushers and wheeled-case draggers is level. Have well-trained staff and excellent information on the platform. This is the London Overground’s philosophy and it looks like Merseyrail are applying it. The title of this post is the same as an article in the August 2017 Edition of Modern Railways. Two of the new EMUs Stadler will build for the Merseyrail network will be fitted with batteries. The initial benefits of the trial will be the energy recycling properties of the batteries, but with a larger battery the option could be to run the units away from the electrified Merseyrail network using battery power. Other reports suggest that battery power could move the trains in depots. Another report in the same edition of Modern Railways is entitled Class 769s For Wales. It discusses the use of Class 769 trains on the Borderlands Line. Would safety regulations permit Class 769s, or other third-rail EMUs retrofitted with diesel engines, to operate the Wrexhm-Bidston Line and continue in the Mersey tunnels to Liverpool? No definite answer was available as Modern Railways went to press. Each bi-mode unit would displace pnly one two-car Class 150/2 unit from the line, but studies have predicted large growth in passenger numbers if the change of trains at Bidston were eliminated. Porterbrook have already talked about converting Class 455 trains into bi-modes. These third-rail units don’t have pantographs to snag in the tunnels. They have been refurbished to a high standard in recent years. The fuel safety problem in the tunnel, is something for which Formula One engineers may have a ready-made solution. I’m sure if it does happen, Scouse humour will go into overdrive, about London cast-offs and old trains. But Class 455 bi-mode trains would have the last laugh. It is encouraging to see in these two articles signs of radical but in my view totally sound thinking.